We had meant to be here by 10:30pm, leaving us with more than enough time, but our train had run into a bit of a delay. It’s 11:15pm when my traveling companion and I finally hear the announcement for Lucerne. The platform is crowded, our packs make us double-wides and complicate the tight situation we’re in. We hurriedly make our way to the main entrance, and I think I’m lightening up our circumstances when I sing-say, “We’re late! We’re late! For a very important date!” But I’m shot a look that says I’m not funny. At 11:30pm (as stated on their website) the Bellpark Hostel would lock their doors for the evening and we would be stranded in the dark, in an unfamiliar city, with a reservation we’ve already paid for and no way to get inside. And we now had less than 15 minutes to get there. We quickly found out that the buses had stopped running for the night. I dug in my pockets and pulled out the scrap paper on which I had written the hostel address and the directions from the train station. We half speed-walked, half sprinted, trying our best to race the clock. It was 11:35pm when we pounded on the door, panting, our lungs burning and a film of sweat gleaming on our foreheads. But all was quiet. Nothing could be heard but the buzz of the streetlights. Plan B. Across the street we spot a playhouse in a park. It’s fenced in but the gate isn’t locked, so we decide to camp there for the night. 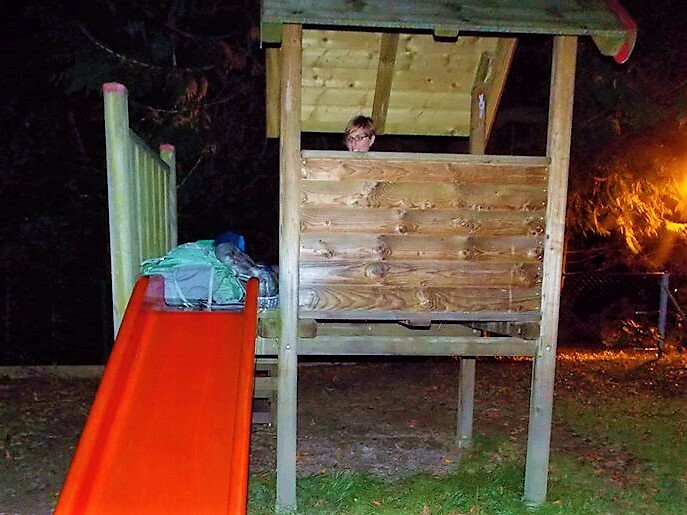 We climb up the slide, take off our packs and shoes, and roll out our sleeping bags. It’s a chilly night, the air is brisk, and the stars are out. There was something quite soothing about being swaddled up in our sleeping bags under the night sky in a foreign country. It had been a long travel day and it didn’t take us long to fall asleep. We wake just at dawn. I sit up, a little stiff from the cold, and instantly make eyes with a woman walking her dog. She starts yelling at me in German, and, although I took the language in high school, I’m nowhere near fluent. She’s obviously agitated. Her tone becomes harsh and she furrows her eyebrows, clearly extremely disproving of my being in the playhouse. She continues on her way, though, and we pack up like mad women and make a dash for the hostel. Once inside and checked in, they offer us their complimentary breakfast since we had already paid for the night before. It was the best breakfast I’d had in weeks – Asian style rice and eggs, delicious! After our stiff nights sleep and unnerving run-in with the angry dog-walker, this was just the comfort food I needed. It was time for some exploring! 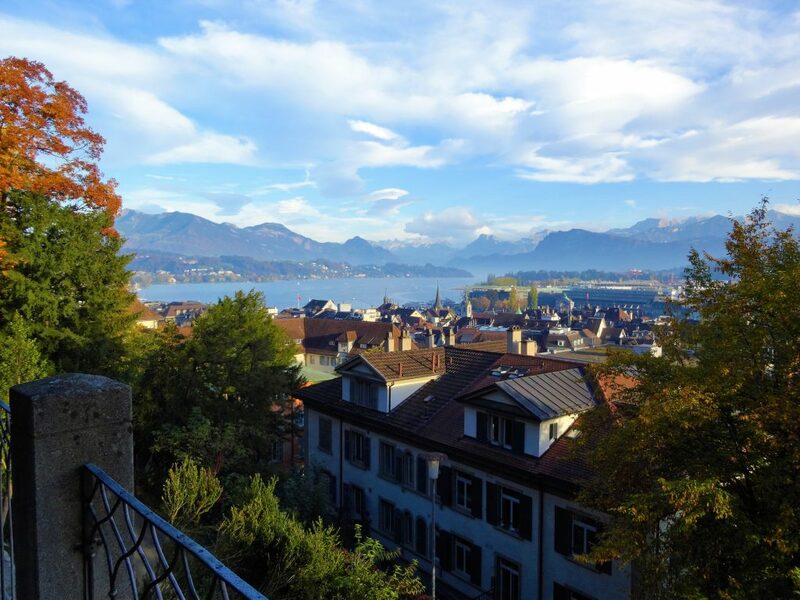 Lake Lucerne is a gorgeous addition to the city and one of the key features that threw it up on the map in the first place. 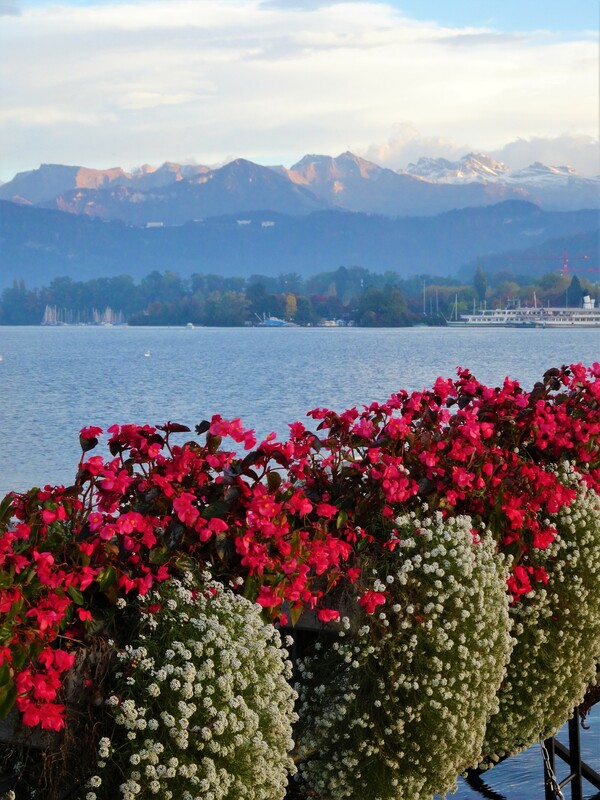 Surrounded by snowcapped mountains, sharp inlets, and dramatic skylines, experiencing the lake by boat is a fantastic way to spend an afternoon. 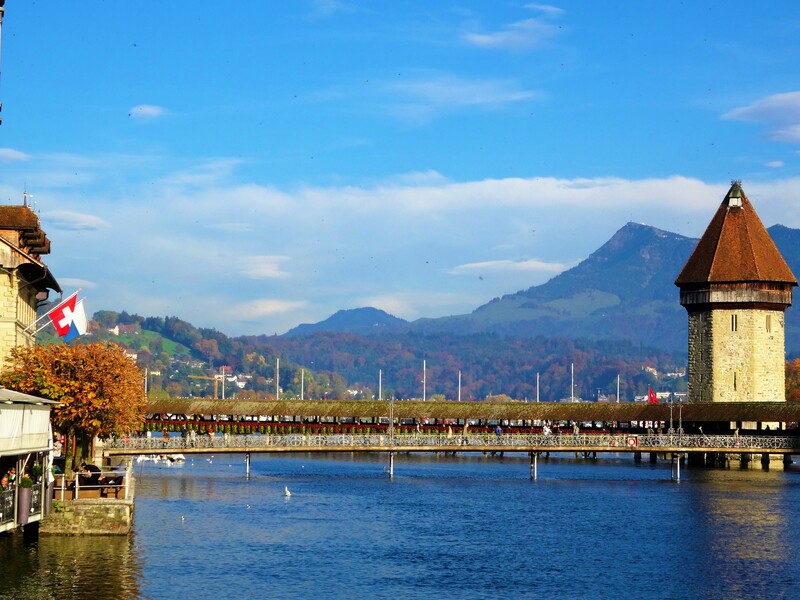 Located on the lower side of Lucerne, where the lake flows into the Reuss is one of the most infamous bridges in Europe, the Chapel Bridge, which crosses diagonally over the Ruess. The Water Tower stands tall and steadfast on the far side of the river. Once used as a dungeon as well as a treasury vault, the Chapel Bridge has now been reduced to nothing more than a club room, off limits to the public. The covered footbridge famed to be the oldest in Europe harbors many paintings under it’s roof trusses, making it one of the most important in all of Europe. You’ll find Spreuer Bridge, also known as The Mill Bridge, less than 100 meters upriver. The Mill Bridge got its name from a decree that once stated wheat chaff and leaves were to be thrown into the river from this bridge alone, and from nowhere else. 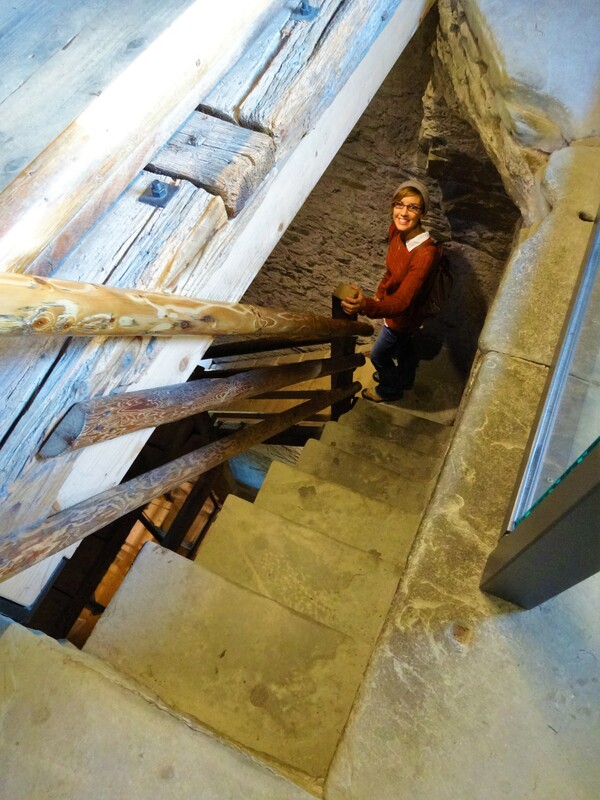 Much like it’s cousin, The Chapel Bridge, it too holds a collection of paintings under it’s wooden trusses. This series of paintings has been dubbed “The Dance of Death.” Symbolic of the steadfast truth that all people from all classes of society and walks of life will experience the reality of dying. A bit farther up river you will find the Nadelwehr, or wooden water spikes that are still being used to feed their hydro power plant, and to regulate the water level in Lake Lucerne. 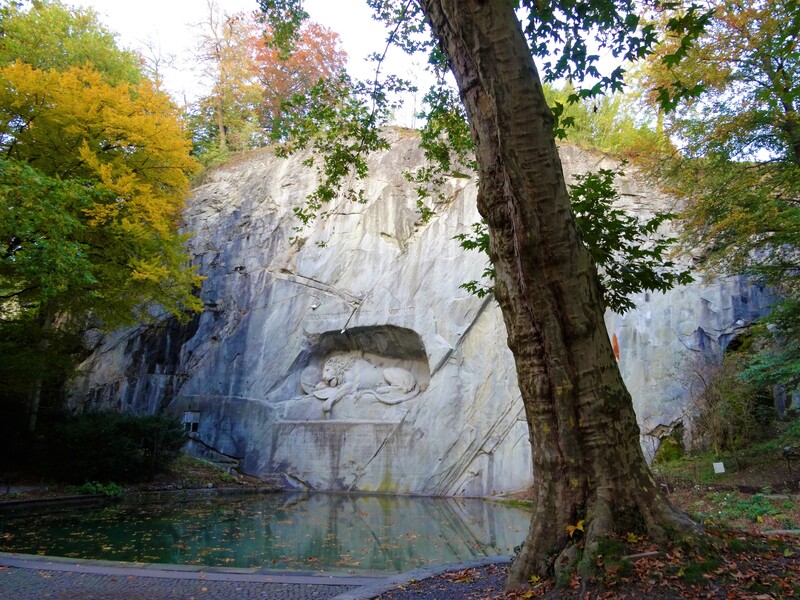 We crossed over the river and headed into the quaint Old Towne to see The Dying Lion of Lucerne. A 32 foot high by 20 foot wide relief carved into a cliff face overlooking a pond on the east side of the city. The Lion itself is shown impaled by a spear, with both a French and Swiss shield, and the inscription that reads, “HELVETIORUM FIDEI AC VIRTUTI” which means, “To the loyalty and bravery of the Swiss.” It is a tribute to the 760 Swiss soldiers who died protecting King Louis XVI during the French Revolution. 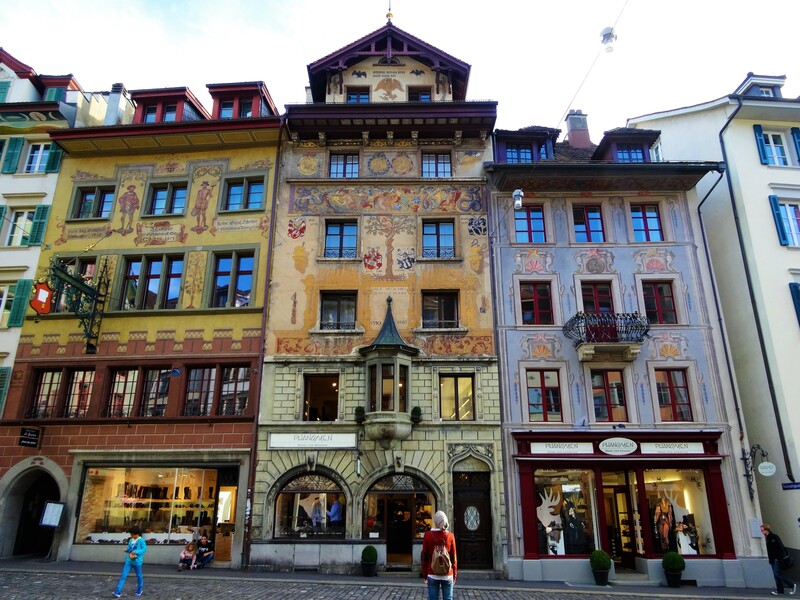 This has become one of the highlight attractions in Lucerne and is free of charge to visit. Old Towne doesn’t seem to have changed much since the medieval times … not that I was there. But I definitely felt I had been taken back in time. The architecture is unparalleled, the buildings are adorned with beautiful frescoes and the squares are filled with majestic statues. There are shops everywhere you turn. 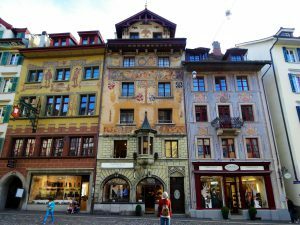 Chocolate shops and shops with every inch of their walls covered in coo-coo clocks, glass case after glass case of Swiss Army knives, bakeries and eateries. Musicians playing romantic tunes as children play in the fountains and couples enjoy a meal at a nearby cafe. 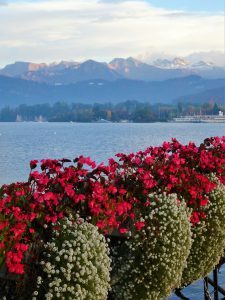 In my opinion, Lucerne is just as romantic a place as Paris or Rome. A perk of sightseeing in this city is that it is easily explored on foot. Check out St. Peter’s Chapel, the Picasso Museum, and grab a bite to eat at The Old Swiss House – a very highly rated and authentic eatery. Although on the pricey end of things, enjoying one meal here is worth the experience. 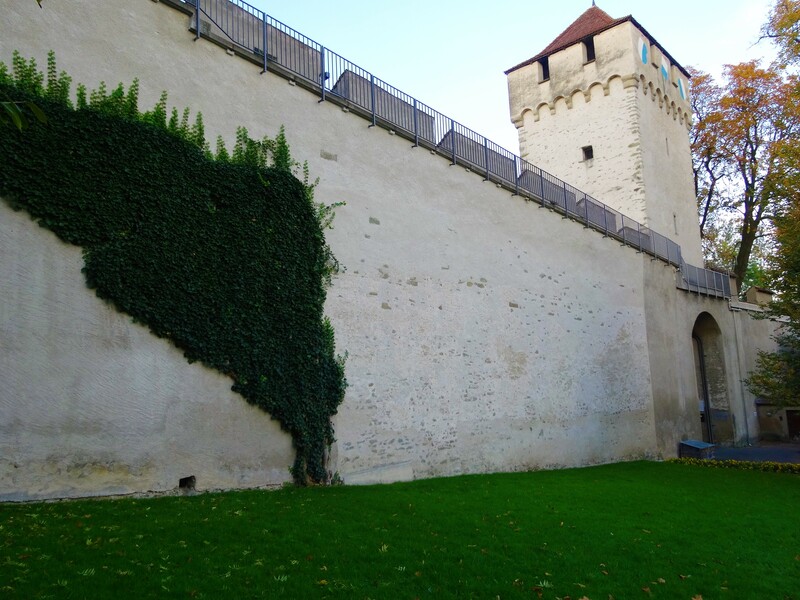 As you pass through Old Towne, continue up the hill and check out the part of the fortification wall that once protected the city. Referred to as The Musegg Wall, a must-see attraction that’s free and generally open from dawn till dusk. There are nine towers, one of which is a fabulous clock tower and upon entering you can see the inner workings of the massive clock. It also chimes one minute before all of the other clocks in town and is incredibly loud, so be weary of standing right next to it at the top of the hour. Yes, I speak from experience! 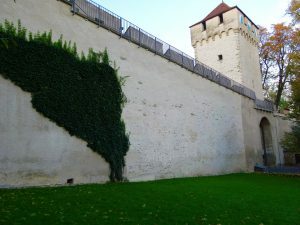 Because the wall sits up on a hill, you can enjoy a beautiful panorama of the city below as you walk the length of it. Some of the steps are very steep, otherwise it’s quite a nice way to spend an hour or so. 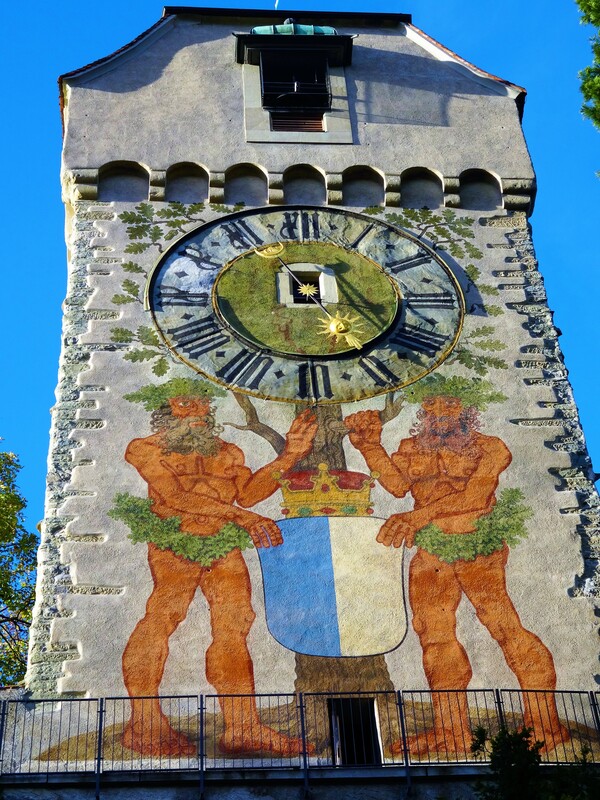 I’ve included a photo of the clock tower, steps inside, and the view from the top! If you go during the summer months, I’d suggest bringing some water. Once you’ve had your fill of Lucerne, venture less than 25 miles away to the town of Engelberg, home of Mt. Titlis. Rising 10,000 feet, this is the highest peak in Central Switzerland. 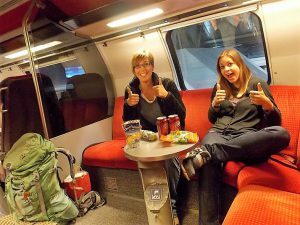 Take the Lucerne-Engelberg Railway for an easy day trip and enjoy the scenic route, winding through forests and mountains and overlooking the valleys below. Once you arrive, you’ll take a series of cable cars to the summit. You’ll cross over the Titlis Glacier, take your chances on the Cliff Walk, see the ice cave, and soak in the endless vista of Alps – Wanna see? Click here! Courtney is a humanitarian at heart! A foodie, adventure junkie, and amateur photographer. 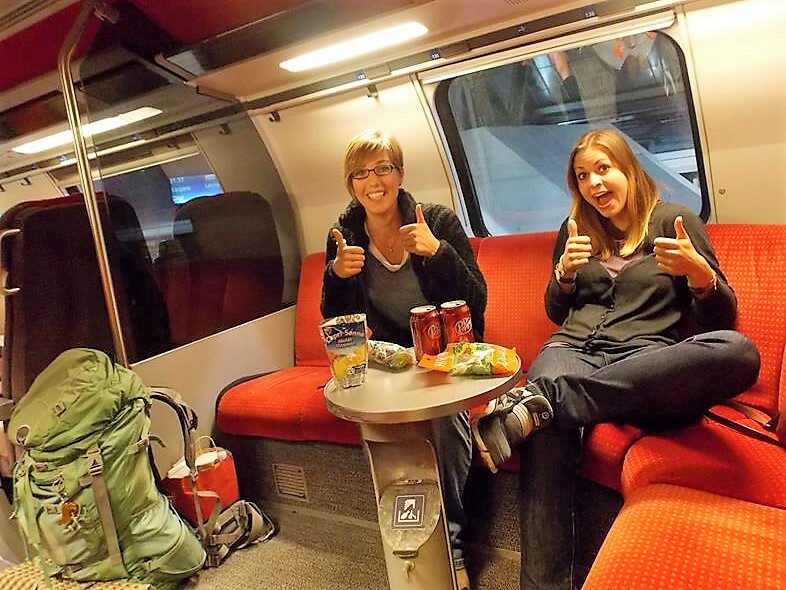 She’s passionate about showing others how travel can be both inexpensive and fulfilling. For some cheap travel tips check out her website and Instagram!